The event will highlight academic excellence at B-CC High School and the Foundation programs that help our students succeed. print the RSVP form and mail it with your check to B-CC HS Educational Foundation, P.O. Box 31209, Bethesda, MD 20824-1209. View invitations (general or staff) for more information. In commemorating its 125th anniversary, The Chevy Chase Land Company, a long-time Foundation supporter, announced this week that it is establishing a new, annual $5,000 scholarship to be awarded to a graduating B-CC High School student planning to pursue a career in architecture, engineering, or land use/ transportation planning. The new “CCLS Smart Growth Scholarship” is intended to support and prepare the next generation of professionals who will be planning and building healthy, environmentally sustainable, and connected communities. The CCLC Smart Growth Scholarship application is available at http://www.cclandco.com/community/Scholarship_form_-_BCC.pdf. Application deadline is April 3, 2015. As the school year begins for B-CC seniors, there is much to look forward to: They’ve survived junior year, with its heavy course load, its endless SAT/ACT practice, and, perhaps most trying of all, its tendency to provoke parental freakouts. So much is behind these 17- and 18-year-olds (well, maybe not the freakouts), but there’s one final hurdle on their path to the future: the college application, and, most angst-producing of all, the application essay. For many students (and their nearby relatives), the experience of producing those 500 words casts a long shadow over the fall of their final year of high school. But for Madeline Linder and 54 other B-CC seniors, these past couple of months were significantly less fraught, thanks to the B-CC High School Educational Foundation’s College Application Essay Workshop. In order to continue to underwrite this workshop, the Foundation needs your help. The college application essay is just one component in our Campaign for Academic Excellence, which comprises a mix of our traditional programs plus some exciting new initiatives, and provides a continuum of year-round support for our students. Donate today and help us help all the students at B-CC! Skip the Tutor, Support TAP! In 10th grade, Shaina Adler, now a senior at B-CC, had met the enemy, and its name was chemistry. Shaina’s experience exemplifies the impact that TAP (Time for Academic Progress), a Foundation-funded afterschool academic support program, has had on many students at B-CC. 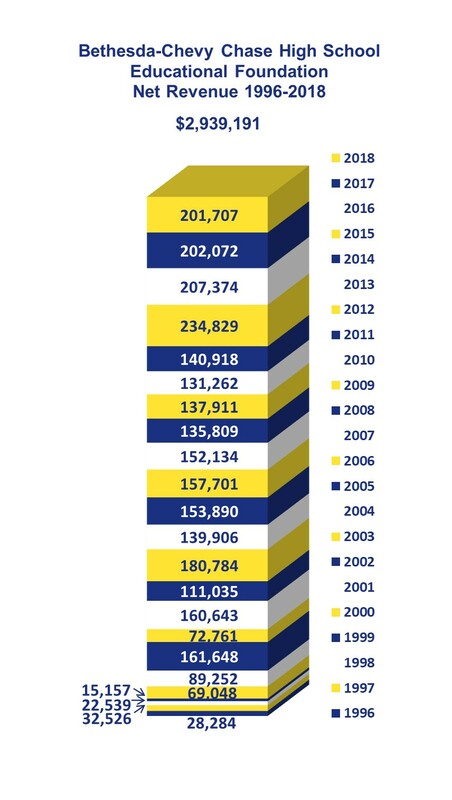 More than 50% of the student body has gone to TAP, and there were over 1200 visits to the program in the 2013-2014 school year. Fully funded by donations to the Foundation since 2003, TAP addresses the needs of all students in all grades, in everything from on-level courses to advanced classes, in math, science, English, and Social Studies. 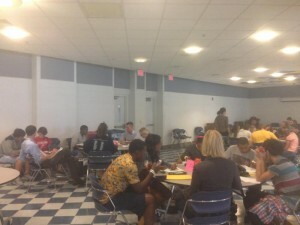 This year, in an effort to reach even more students, TAP has been revamped, based on recommendations from the teachers: It’s now centralized in the cafeteria (rather than spread out in different classrooms), so students can get help with several subjects if they need it, and to create a sort of “student union” feel. Football coaches have moved the team study hall to the cafeteria, allowing players to get the academic assistance they need in specific subjects. The students now have better access to the Cyber Café, a computer center created with funding from the Foundation. Another innovation has been the creation of a “TAP folder,” which allows students who want comments on a paper to save their drafts online during the day. TAP English teachers comment on the drafts electronically, so students can get help without needing to be physically present. The cafeteria has also chipped in by providing snacks. Six to seven teachers are there every day, with a total of twelve staffing the program. The changes are working. Attendance has risen significantly and students are not only getting help in multiple subjects but they are getting help from multiple sources. “The atmosphere is vibrant and the numbers [of students] are increasing,” says Stacy Farrar, the program coordinator. In order to continue to underwrite TAP, the Foundation needs your help. TAP is one of the Foundation’s most well-known programs, but it is just one component in our Campaign for Academic Excellence. The Campaign comprises a mix of our traditional programs plus some exciting new initiatives, and provides a continuum of year-round support for our students. Donate now and help us help ALL the students at B-CC! A big thank you to B-CC Senior James Becker, President of the Scandinavian Club, for hosting an incredible evening with two Nobel Prize winners! 250 people came to be inspired by Dr. Thomas Schelling (2005, Economics) and Dr. William Phillips (1997, Physics) and support the Foundation. Highlights from the event are available in this video, courtesy of MCPS.